The first time I ever heard of Swedish melodic metal / hard rock band Dynazty was sometime around 2007 or 2008 when Chris Laney played me a demo by the guys, a demo that would be released as their debut album Bring The Thunder back in 2009. The first time I heard the band, I was underwhelmed. I could hear that they were a bunch of really good musicians, but I couldn’t hear the songs, I couldn’t hear any hits. It would take the release party for said album for me to wake up and smell the coffee, it was there when I realised just how brilliant their musicianship were and it was there when I discovered just how good their songs were. But it wouldn’t take very long before one of their guitarists, John Berg, jumped the Dynazty ship to pursuit other musical challenges. 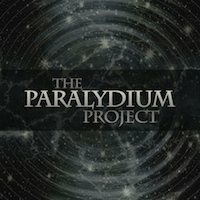 Now, Berg is the reason why I’m babbling about Dynazty in this review because The Paralydium Project is Berg’s baby from go and the first sign of musical life he has shown since his departure from Dynazty, except for guesting on Chris Laney’s solo records and playing a few gigs in Laney’s solo band. The project also contains Dynazty drummer George Egg and Dynazty’s new bass player Jonathan Olsson. The project also contains Engel and Degradead lead vocalist Mikael Sehlin, Mikael Jansson from Degreed on keyboards and Therion vocalist Linnea Vikström. And just to make sure you get this, this project sounds nothing like Dynazty at all. The fact that this E.P. (damn those E.P.s, I want albums. Albums, I said!) only contains three tracks, but is 24 minutes long might give you a hint what kind of music we are being served here. Yes, my friends, this heavy metal with a big chunk of progressive and on top of that, catchy melodies that sometimes even borders to pop. Sounds intriguing? Well, I think so too, so let’s get a bit deeper into what this lot have to offer. This is why I have issues with E.P.s. When I get three tracks that are as brilliant as these, I want more – I want an album which in this case should be something like eight tracks. I’m gonna give this record the whole nine yards, but be sure to bear in mind that this is only three tracks and it’s really impossible to tell what I would give this record if there was more tracks on it – 10/10 for three tracks isn’t really the same as 10/10 for eight or ten tracks, not to take away anything from what Berg and his buddies have achieved here – the three tracks are really all amazingly good. And so is the production. The songs are self-produced and it really sounds like a million bucks, very professional. So, if you’re into the bands mentioned above – but you must know that the music is far from AOR, that’s just a smaller influence – I suggest you get a hold of this album. However, as for now, no actual CD or vinyl has been printed, so the album is just available digitally, from iTunes and Amazon, but it’s also out on Spotify. But if the demand is high enough, they will print CDs. So what are you waiting for? Demand CDs, dammit! And until they do, buy this anyway.